I wrote the article below in July 2012, and having just finished a bottle of Moondarra Studebaker Pinot Noir 2012–an ode to Neill Prentice selling his 57 Studebaker to pay for the vineyards trellis posts–I thought it would be fitting to revisit it, as I broach a glass of Moondarra Conception Pinot Noir, some 20 months down the track, is enticingly minerally and brooding in its bouquet; I would suggest somewhat in hibernation in terms of fruit, but the coiled up energy is there and as it breathed out delivered a powerful spicy, mouth-filling, succulence–I would say revisit in another 3 or 4 years. Having managed to distance myself from the polemic of Australia’s wine image woe’s, my indifference is largely due to the countries dominance of pedestrian, industrial wines and admittedly surrendering to the ‘dark side’ of commercial forces with the reality that mediocrity rules. And yet, over the last few months I have tasted in succession some amazing Australian wines – A 10 year vertical of Mount Horrocks Semillon, all in impeccable condition and one of the world’s great white wine bargains. Then a snapshot of 4 vintages spaced 5 years apart marking the 20th vintage of Grosset Gaia, an aberration in Australian cabernets and none of the wines peaking yet. An indelible lunch at Gembrook Hill in the Yarra Valley hills with their 2003 Sauvignon Blanc a revelation and showing no signs of fading at 9 years of age, likewise their 1997 Pinot Noir equally showing incredible complexity and longevity. Another memorable lunch, at Jasper Hill up in Heathcote, Victoria with a 1997 Georgia’s Paddock Shiraz, the epitome of cool-climate, elegant yet hedonistic shiraz in Australia. Also, irrefutable evidence for the merits of biodynamic viticulture with the new releases from the iconic Margaret River producer Cullen, the Kevin John Chardonnay 2010 and Diana Madeleine Cabernets 2010 seamless in their elegance and incredible pure fruit vibrancy. A touchstone Giaconda Chardonnay 2008 that outclasses any white burgundy, including ‘Le Montrachet’ furthermore the 2006 Aeolia, the world’s benchmark of rousanne and yet Kinzbrunner is going to graft it because the Australian press don’t rate it – a vinous tragedy. Then there’s a bottle of 1993 Bass Philip Estate Pinot Noir liberated with the enigmatic proprietor Phillip Jones that would impress the most patriotic burgundy winemaker. I just recently wrote of TarraWarra Reserve Pinot Noir 2010, an absolute blinder with its rich and prodigiously textured style. And there’s a whole lot more… but why should I bother writing on these exceptional Australian wines; a futile exercise it seems with such scepticism on the global wine stage. Moreover, why should I tell you about Moondarra, the single most profound, exuberantly silky, seductively rich and potent, rarest pair of pinot noirs on this planet, when it comes from Australia; surely you will be cynical if not indifferent. I am reminded of the sage words of a veteran Melbourne Wine Merchant, “Curtis, don’t tell them anything. Give them what they want, so we can drink what we want.” However, I think it’s time the rest of the world comprehended how truly remarkable Australian wines are. That is not to say Australia isn’t recognised for making good wine, indeed it has a formidable record in this arena however, the world is awash with good wine and the ever-increasing competiveness of Chile, Argentina, South Africa and who knows, maybe even China in the future, moreover the renaissance of indigenous varieties in the old world now has Australia on the (marketing) back foot. The crux of the problem is the perception Australia does not make great wine, or certainly has yet to convince consumers worldwide that it makes captivatingly interesting or unique, highly complex wines of great pedigree and longevity that reflect a special place or terroir, such as bordeaux, burgundy or barolo. And yet this misconception and subsequent misinformation could not be farther from the truth and Australia has been making exceptional wine for well over a century and has some of the oldest vines in the world to prove it – and THE oldest soils and unique terroir on the this planet. I was recently talking at length on this very subject with the renown English wine writer and author, Andrew Jefford, who is arguably more au courant on Australian terroir and viticulture than any other commentator in the world, including Australian, and shares my enthusiasm for real Australian wine. Jefford was on his way back from Australia to Montpellier, France where he resides, stopping over in Singapore where we caught up and had an in-depth discussion on the research he has been undertaking for his next book, on the subject of Australian terroir. His research has seen him travel extensively throughout all the wine regions of Australia and meeting all walks of vigneron, to which he wrote in his Decanter Blog, June 18th, ‘The Revaluation of all Values – in Hotpants,’ a cutting-edge account of how Australian winemakers are arguably at the forefront of the ‘natural’ wine movement, least making wines that are sound in quality. Jeffords article reverberated in my consciousness as I broached the new releases of Moondarra Conception & Samba Side Pinot Noir 2010 with the knowledge proprietor Neil Prentice is about as au natural as it gets and your archetypical new-age Australian vigneron. Actually, there’s something wonderfully unstable about Prentice – in the nicest possible way – and oddly reassuring in his genuine eccentricity and Spike Milligan like joviality with a telescopic gleam in his eyes that transcends the Milky Way. His passionately animated and impelling gastronomic doxology on wine, restaurants, dining trends and pursuing great fresh produce is magnetic, even if he does have pauses – in outer-space – for long moments of thought… and somewhere in the conversation you hope you can catch up – at light speed – with his telepathy. But this delirium seems completely appropriate for a man who is totally obsessed with his herd of Wagyu cows as much as he is with pinot noir. Besides, I have never had a great pinot noir from a straight wine producer – they normally make cabernet. It’s like you have to be a bit bent in some way to be in tune with the pinot noir variety – with its peculiarities and oddity – in as much a person is interesting for their eccentricities. The association between the implied hippy personality of winemakers and such methods as natural wines and organic or biodynamic viticulture is rather intriguing, given there are many vignerons I have met in France and Italy that know nothing other than this, for generations, and I would hardly characterise them as hippies; to which they shrug their shoulders in amusement of all this newfound fixation on natural wines. In the same vein, Neil Prentice has never really branded himself a natural winemaker and yet he’s been doing such way before all of these new kids on the block (and that’s not just Australia) started righteously pontificating and congratulating themselves on saving the wine world. Indeed, I was Prentice’s Australian distributor when he released his first wines in the mid 90s, one of which was a chenin blanc, wild-yeast fermented to bone-dryness with little intervention and terrifying natural acidity; about as natural as it comes with more than a wink to the Loire Valley communes of Savennières and (dry) Vouvray. By the way, you could not give away chenin blanc in Australia at the time, and yet we ploughed through 1000 cases in no time and had sommeliers and the modern Asian restaurant set taking a bath in it. Prentice continued to flirt with the unconventional, namely pinot gris with his Holly’s Garden label, spurred on by his close relationship with the late Donlevy Fitzpatrick, the original nonconformist and Melbourne’s legendary restaurateur and trendsetting gastronomic protagonist. This fixation with pinot gris has tested both Australian palates and brains; being one of the few winemakers brave enough to produce a richer, slightly sweet style in the Alsace vein and flying in the face of the colloquial taste for dry wines and finding himself in marketing no-man’s land. Prentice approaches pinot gris totally ‘naturally’ with the combination of his vineyards situated in the high-altitude cool-climate of the Whitlands High Plateau with the long hang-time and extended ripening of the grapes simply a natural equilibrium between residual sugar and the exhilarating acidity he achieves, moreover it results in a powerful, luscious wine juxtaposed by tantalising piquancy that is – simply delicious. 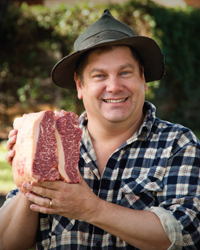 Following his ecclesiastical belief that wine is meant to be drunk with food, I am sure Prentice will have the last laugh, as consumers are already realising thin, dry pinot gris grown in warmer climates has about as much flavour as Evian Water and the richer style that he makes is actually a natural partner to the modern Asian food that is prevalent in Australia. The Moondarra story begins in 1991 when the Prentice family purchased a farm in the Gippsland Mountain Rivers District, although in terms of terroir, the story really began over 580 million years ago, during the Cambrian period when Australia was part of the much larger continent of Gondwana and Gippsland was deep underwater creating thick Silurian and Devonian siltstone and sandstone. By the middle of the Devonian period, 385-400 million years ago, most of Victoria was no longer covered by ocean and for the next 250 million years eroded by the elements. In the late Jurassic and early Cretaceous periods, 160 million years ago, Australia began to split apart from Antarctica with tumultuous tectonic and volcanic activity which formed the rugged high country called the Great Dividing Range and East Gippsland Mountain District with the grinding, folding fault lines of the Walhalla synclinorium forming massive quartz reefs and gold. Yes gold, and lots of it with Walhalla a major part of 19th century Victorian gold rush. Moondarra is only 23 km from these goldfields although it is best described as wild, windswept potato growing country with rich dark greyish brown to dark red clay loam soils. As Prentice puts it, in his eloquent way, “We planted pinot noir on an old spud paddock”, but there’s that gleam of outer space in his eyes – knowing the roots of his vines reach deep into the beginning of time – Palaeozoic mineral-infused, calcareous, volcanic soils – an extraordinary terroir, or “Bloody old dirt” in the Prentice vernacular. It paints a fascinating picture yet even more intriguing and illustrating the complexities in contributing factors of terroir, the two Moondarra Pinot Noir cuvees that Prentice makes essentially come from the same patch of vines and soils, made in the same way and yet are radically different wines; which is directly attributed to the diverse vineyard aspects. From the North West aspect the vines are exposed to the South Westerly winds and intense afternoon sun, consistently producing a more robust, firmer pinot noir of monumental proportions. 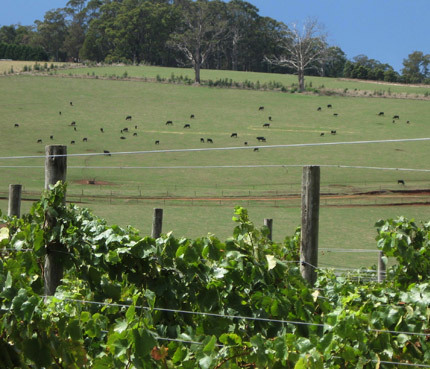 This section of the vineyard borders the Moondarra State Forest where the Samba deer would come into the vineyard for a little natural crop thinning, further concentrating the wine (as if it needed it) and hence called “Samba Side”. The North East aspect the vineyard is more sheltered from these winds and the afternoon sun less direct or more specifically exposed to the morning sun and the resulting wine markedly elegant by comparison although certainly not lacking for power and energy in the fruit. This cuvee is called “Conception” with reference to some extra-curricular (conceiving) activities in the vineyard; au natural viticultural practices indeed! The vines at Moondarra have never been irrigated or seen any fertilizers and Prentice embraces sustainable viticulture and has largely adopted the ideologies of biodynamic practices although he is more inclined to categorise himself as a Pagan farmer, which perhaps has more relevance to his belief in the olde methods, although there’s unquestionably a certain metaphysical animism about Prentice – and a pantheism gaze. The yields at Moondarra are miniscule, invariably below one ton to the acre, in part due to the very high planting density of the vines but also the combination of being dry-grown and the vineyards aspect to the harsh elements. If this all seems to have a ring of ‘not-for profit’ figure that Prentice did not release his first Moondarra Pinot Noir until the vines were 7 years-old and there were three consecutive vintages in the mid-2000s where a succession of frosts and bushfires wiped out all the fruit. In some vintages yields have been so low that only one barrel of Samba Side was made; that’s 22 cases – which is what you would call a truly rare wine. I helped Prentice launch Moondarra; that is 10 six-packs of 1998 Pinot Noir from the North West section or Samba Side. Perhaps launch is too lofty a word as it was an unceremonious intimate gathering of three guests at Prentice’s Japanese tapas and wine bar in St. Kilda, ‘The Birdcage’. We had invited Phillip Rich, then wine director/buyer for The Prince Hotel and Stokehouse, along with Grant Van Every, Australia’s most respected Sommelier and Donlevy Fitzpatrick, the countries ultimate arbitrator on all matters of style, including pinot noir. We had intentionally kept the group small and confined to industry elite, not because of the lack of wine, but more to install a sense of the ‘underground cult’ and have the word of mouth, or the proverbial ‘grapevine’ do the talking. We also took the gamble of serving up the wine blind in a comparative tasting with the likes of DRC La Tache and Comte de Vogue Le Musigny with considerable risk as all our invitees were passionate burgundy lovers. Thankfully, although not surprisingly for Neil and me, the outcome was positive with the Moondarra mistaken for Grand Cru Burgundy and our professionals were gobsmacked, moreover fighting over the divvying up of the six packs. It wasn’t long before bottles of 1998 Moondarra Pinot Noir were being scrutinised and served up blind at the most discerning tables and amongst wine enthusiasts; as the adage goes, “nothing is more desirable than the unobtainable” – the job was done. What is most telling for me, apart from my writing being as bad then as it is now, is the unwavering and distinctive style of the two cuvees and when I compare my notes on the 2010 wines it is commendable that ten years on, these wines have remained true to their terroir and natural expression of ‘A sense of place’. Prentice tells me that little has changed in the winemaking since inception (conception) although lately he has been inspired by Collio winemaker Josko Gravner who is known for championing biodynamics and the use of amphorae for fermenting his white wines; a strong movement amongst natural winemakers. I assume Prentice’s Greco-Roman polytheism inspiration is going to further torment pinot gris consumers and you can be assured there are other less-conventional white varieties appearing in his galaxy. 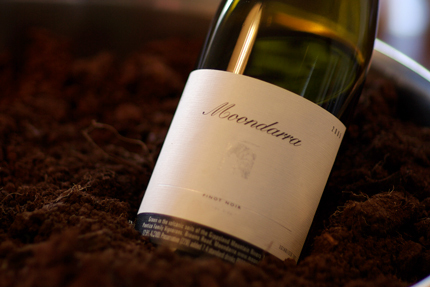 The winemaking methods for Moondarra Pinot Noir have largely followed the Guy Accad philosophies, which are in effect a contemporary refinement of the legendary Henry Jayer’s ideologies and methods. Jayer is the undisputed king of burgundy and his adage that “Wine is made in the vineyard” with high density planting and low-yields is paramount. He also advocated minimal intervention in winemaking however, his technique of cold soaking for 5 to 7 days (maceration of the grape skins and juice pre-fermentation) could be viewed as somewhat interventionist. Accad took this cold-soak technique even further, prescribing a 10 day pre-fermentation maceration which requires additions of sulphur at the point of crushing the grapes, which is a matter of contention amongst the natural wine movement, even though this has been organic since Ancient Roman times. Prentice upholds the Accad cold-soak regime and also the concept of a relatively high proportion of whole bunches in the ferment; that is whole clusters of grapes, stalks, stems and all. This is perhaps the most unconventional of Prentice’s pinot noir techniques in Australian terms, as for the most part grape stems in Australia’s maritime cool-climate lack ripeness and impart a tannic green bitterness. However, the continental-climate at Moondarra allows a long hang-time with very slow ripening into the late autumn allowing the stems to properly dry out, essentially fully ripe, a premise in the Accad methodology. The addition of whole bunches imparts considerable structure in the wine and subtle pleasant, savoury bitterness; attributes that are inherent in Domaine de la Romanee Conti. Fermentation by wild yeast is a standard for natural winemaking, as it is at Moondarra, although the ferment is kept cool which might agitate some of the radicals of the movement. Equally, no fining or filtering is obligatory and Prentice aims to use gravity as much as possible in any movement of the wine, a policy he refers to as his “Luddite mentality” with a dislike for machinery and is convinced this preserves some of the vital elements of aroma in pinot noir. Having shared the 2010 Moondarra Samba Side and Conception Pinot Noirs (blind) with some Singaporean burgundy nuts and international wine journalists, their reaction to the wines was predictable; all were amazed at the concentration, energy and purity of fruit and burgundy-like complexity and acidity of the Conception, indeed all thought it was in fact burgundy. The Samba Side for most was easily identified as New World and logically Australian although a few thought it was from Central Otago, indeed some thought it was Felton Road Block 5. I can identify with the Felton Road comparison in the sense that both are monumental, profound wines and interestingly owe much of their prodigious attributes to a continental climate. Personally, I try to avoid too much direct comparisons to burgundy although it is only human – that the hypocrite suit comes out of the closet – however such comparatives lose sight of the underlying facets of terroir – but sometimes such contest is necessary to combat the prejudices. The fact is the Southern Hemisphere climate and sunlight is completely different to the Northern Hemisphere. Andrew Jefford explained to me that even in the warmest and sunniest of burgundy vintages, you will still have considerable cloud cover and a diffusion of light. The Antipodean of this, as Sam Neill, proprietor of Two Paddocks vineyard in Central Otago, puts it “There is a special light in Central Otago” with long autumn evenings where then sun sets behind the mountains as late as 10pm; then the temperature plummets by 10 degrees Celsius. This is definitively – terroir. As much as I like the Moondarra Conception Pinot Noir and its ability to defy burgundy enthusiasts, I am totally enamoured with the Samba Side; a wine that pushes the boundaries of pinot noir to the extreme limit, yet looses none of its pinosity, with its completely and utterly seductive flamboyance and saturation of fruit, muscular concentration and formidable natural acidity. It is like no other New World pinot noir and stretching the indulgence of comparisons, it is like comparing a village Barbaresco with Gaja Sori Tildin – and that’s arguably close to perfection in wine. Moondarra Conception Pinot Noir 2010 – Deep brooding scents of morello cherry and mulberry, as it breaths richer-sweeter blueberry and cherry become more alluring, beyond primary with secondary complexities of dried tamarind peel and balsamic notes, tobacco- cigar scents, smoky burning wok spice aromas, black mustard seed and star anise, mineral infused with wet sand beach and wet bluestone smells, cold railway iron and clay pottery with a persuasive clarity of earth-derived scents. Incredibly intense raspberry, red currant and sour cherry fruit lashes the palate, exhilarating and impossibly concentrated depth of fruit, beyond the norm, incredible grappa-like purity and infused with minerals – iron filings, wet bluestone and torrent of wonderful acidity, driving the piquancy of redcurrant tweaked by a touch of dried- herbal nuances; young Barolo-like ripe, chewy, dusty tannins kick in, fine-grained and persistent, all adding to an amazing energy, length and tension. Elegantly framed yet exhilarating stuff – the pinot noir equivalent of a Luge ride with Tony Benshoof. Cellar for a minimum of 5 years and will cruise past a decade in bottle. Moondarra Samba Side Pinot Noir 2010 – Hedonistic, dense, concentrated black cherry, blackberry, blood plum, muscatels and dried fig (Amarone-like) bouquet, even black in colour, smoky fireside charcoal, rich-lactose-creamy sensations, infused with spice – five spice, anise amongst dark cacao and savoury, meaty grilled sirloin nuances, alluring burnt timbers and a funky cheesy-parmesan quality amongst a lingering sweet berry eau de vie like vapour. Voluminous, dense saturation of black cherry, blackberry reaches every taste tentacle, a French Kiss of gorgeous mouth-filling fruit with layer upon layer of plush, seamless creamy texture, the concentration and intensity nothing short of extraordinary, yet checked by steely cold, iron coated, minerally cobalt acidity and muscular tannins; The mother of all pinots. It will make pinot purists hair curl and defies gravity but about as sensually exciting as red wine gets and if you can find a couple of bottles try one now out of sheer indulgence, and hide the other one in the cellar. In a land where potentially great wine is too often homogenized and neutered by adjustment, with much of its sense of terroir consequently erased, discovering Moondarra and understanding the living organism that is Neil Prentice is the vinous equivalent of the Higgs Boson God particle and may throw up more questions than answers but at least you’re in the Universe of pinot noir. As for Australia’s two speed wine industry; actually it more like three-speed with the established hands-on artisans that spurred a renaissance of boutique wineries in the 80s and 90s making great wine. Then there are the recalcitrant young guns of the new millennium flirting with natural wines, actually flirting with everything and an exciting evolution-revolution is taking place. And then there are the wine factories and city-vignerons that spend more time with accountants looking for tax relief and appeasing shareholders; producing ordinary, pedestrian wine that challenges the senses of no one but the marketing and advertising companies and even they are lost at sea.